This is an extensively inscribed dial, with Latin texts on the characteristics and use of the instrument. The vertical pin gnomon dial marks the length of the day and the declination of the Sun, whereas the string gnomon dial (vertical and horizontal) marks common hours for five different latitudes. 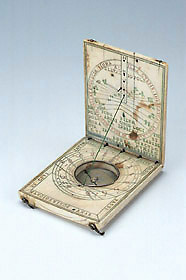 The dial has both the mark and signature of Hans Tucher and the quality mark 'n' (for Nuremberg).